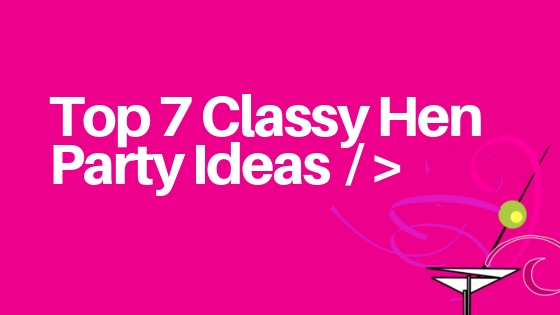 Classy hen party ideas ​you say? Hen parties don’t have to be all about L plates, willy straws, inflatable males and shots of Sambucca at 6am! The classy hen do is well and truly on the rise, with bride tribes everywhere looking for a weekend of sophistication rather than a weekend of debauchery. If you are ​planning a hen party​ which oozes class let’s take a look at the top 7 ​classy hen party ideas ​for 2019. Ah, how we love a good old ​Afternoon Tea​! Afternoon tea is a quintessentially British treat, and is the perfect way to kick off a sophisticated hen weekend. What could be better than being surrounded by friends and family having a good old gossip over some delicious treats, tea, and prosecco? Whether you want to go for a vintage tea, high end affair, or a themed tea room, if you do your research, there’s so many options in every city centre to choose from. 5* hotels, exclusive restaurants and high end bars can all cater for a classy hen party (just leave the inflatables at home on this occasion!). Cocktail making is a tried and tested classy hen party idea, and remains popular for a very good reason! What’s not to love about making some delicious cocktails, learning all about the art of cocktail making, and best of all, getting to drink them afterwards! With mixology (high end cocktail making!) remaining a massive trend, it seems like cocktail making isn’t going out of style anytime soon. It’s the perfect ​classy hen party​ activity that will keep you and you your hens entertained putting together all of your favourite summer drinks, mixing them, and then drinking them. Yum! Well, we are slightly biased, but we have to say that this is our favourite idea on the list! Why? It’s the perfect activity for all ages and abilities to get involved in, is a classy activity with a difference, and is a great way to break up the cocktail drinking throughout the day! Whether you want to master the ​best dance moves from Dirty Dancing, the famous ​dance scene from Michael Jackson’s Thriller!​ Or, let’s keep it really classy and learn to Salsa, Cha-Cha and waltz with a Strictly Come Dancing Masterclass. A vintage Roaring 20’s theme is the perfect class to add a touch of vintage to your hen weekend (pair that with a vintage afternoon tea, some flapper fabulous fancy dress, and you are all set for a fantastic, sophisticated afternoon!). A classy dance class in a great venue, your own choreographer, bubbly and more! If you are looking for a really ​classy hen party​ idea, and something that’s relaxing at the same time why not book a spa day with the girls? A day on the hot tub, getting your nails done and a range of beauty treatments will leave you all refreshed and looking absolutely stunning! The perfect Sunday afternoon activity after a night spent boogieing with your nearest and dearest. With plenty of options either right on your doorstep in the city centre, or in a more scenic, countryside setting, it’s an activity that’s accessible whatever your hen weekend location. Manicures, Massages, pedicures, facials…and a glass of bubbly….where do I sign? It’s most certainly different, and what a great experience it will be spending the day in the sun (fingers crossed for good weather) and a night under the stars. Don’t worry, you won’t be all cooked up in a festival style tent, Glamping is camping, with a bit of added glam…a lot more luxurious than the traditional form of camping! It’s the perfect setting for some fun hen party games with the bride to be! Toast some marshmallows up, and don’t forget the vino. Who doesn’t love a reason to get dressed up to the hilt? Your favourite dress, high heels at the ready and all the girls in tow. A private table booked, prosecco on arrival, all the girls (and boys), wine on the table, starters, main course and dessert! More drinks ladies? If you want to keep things classy, but chilled, why not hire a private chef for the evening and have them whip you up some delicious treats at your hen house! As you know ladies, the bottomless brunch always starts classy but be careful….as it can end up getting slightly less sophisticated as minutes tick by if you don’t watch out! I mean, bottomless prosecco for 2 hours? It’s a dangerous game! It’s a guaranteed giggle, but if you’re wanting to keep things on the classy side make sure you’re keeping a glass of water by your side at all times too! Despite hen parties having a reputation for sometimes being raucous weekends of inflatables, shots and debauchery (which, don’t get us wrong, can be GREAT fun!) , we also understand that more and more people are looking for a more intimate and classy hen party. It’s about doing what makes your bride to be happy! Think outside the box and let your imagination run wild….there are so many ​classy hen party ideas ​we could have been here all night.